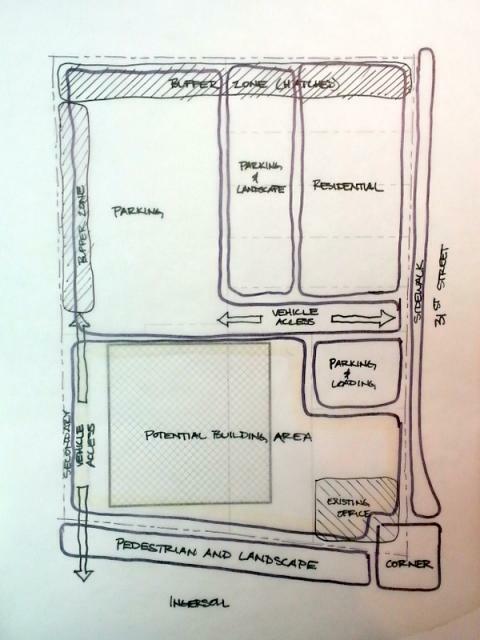 The image below shows a potential pedestrian-oriented site plan at 31st and Ingersoll that accommodates a building the size of a typical "The Fresh Market" (Fresh Market website) (21,000 square feet, indicated as a hatched square). Upon first glance at the zoning code, in the NPC, a building this size and use requires about 65 parking spaces and two off-street loading docks. Additional parking would be required if there is a second floor with office or residential. I've subdivided the site into approximate zones that make sense from a pedestrian-oriented redevelopment strategy. "Charette" Sketch of Pedestrian-Oriented Development: This sketch is a 4-minute "charette" showing one way of laying out the new development at 31st and Ingersoll in a pedestrian-oriented manner. It is not based on any actual discussion with the developer, nor a thorough review of the applicable zoning and building codes. However, it can give a general sense of priorities as we seek to enhance the established Neighborhood Pedestrian Commercial district. Zoning regulations are a tool communities use to protect property values and guide future development in ways that support an established vision. Ingersoll Avenue betweten MLK and 42nd Street is zoned "Neighborhood Pedestrian Commercial", for the most part. This district type is characterized by multistory brick apartments and one- and two-story commercial buildings with multiple tenants and minimal setback from the primary commercial street. It is intended to include specialty retail and office uses that serve the adjacent residential areas as well as the entire city. 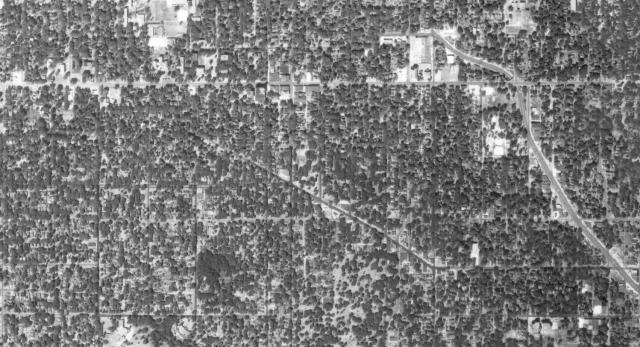 In 1950, Hud and Ellen Weeks purchased land from Hud’s parents to build a home for their growing family. An otherwise unremarkable story might have ended there but for two things: Hud was the son of Des Moines makeup magnate Carl Weeks, and the parcel they purchased was carved from the Salisbury House grounds, Hud and Ellen Weeks Home - Double Lustron Kitchennow a national landmark and museum. 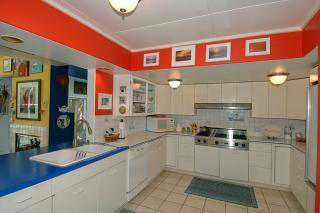 On this historic site, Hud and Ellen commissioned a unique modern dwelling comprised of two “Lustron” ready-to-assemble steel home kits built around a central atrium. Only about 2,000 Lustrons remain in the world today. The double Lustron home was significant architecturally due to its distinctive design and historically because of its association with an influential Des Moines family. On a chilly February morning in 2013, Salisbury House staff arrived to find massive machines tearing into the enameled steel-cladding of Hud and Ellen Weeks’ former home. A developer had purchased the lot and proceeded with demolition. Historians had no chance to document or reclaim any portion of the structure for study or reuse. This story is playing out today with the demolition of three century-old buildings for expansion of the EMC Insurance Companies in downtown Des Moines. 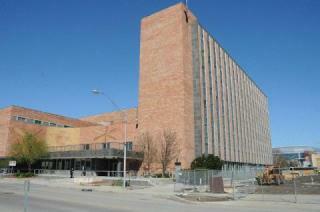 Last week I helped present a forum on historic preservation. 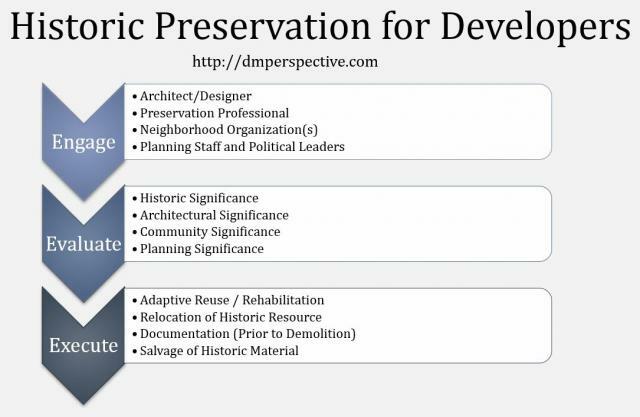 Titled "Pragmatic Preservation," the underlying goal was to help promote a climate where developers and preservationists could find common ground. The panel included people with practical experience on both sides. Issues and current events were debated in a civil and, well, pragmatic discussion. I walked away from the event with practical ideas and the general feeling that perhaps there was a way to negotiate an honest if uneasy truce. As you may or may not know, CVS is planning a new box store to replace the buildings on the northwest corner and when I pushed to have it built on the corner with the parking lot behind it, they balked. CVS has been working for some time to assemble land and push through the zoning and permitting process for constructing a new store (the first CVS in Des Moines) on Euclid between 2nd and 3rd Avenues. My friends in River Bend have been working diligently for several years on revitalization of the Sixth Avenue Corridor - their hard work is finally coming to fruition! 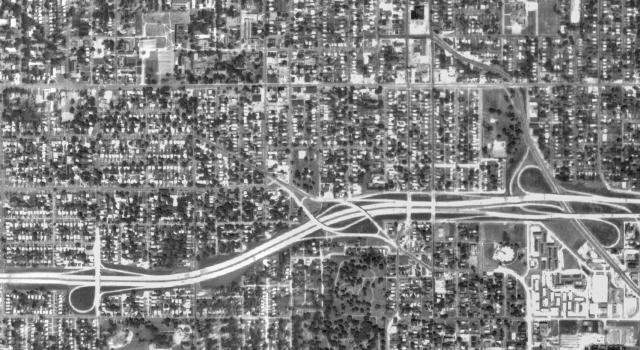 The process started with organizing property owners along Sixth Avenue from the Mercy to the river to work together (no small task in and of itself). Designation as an "Main Street Urban Neighborhood District" by the Department of Economic Development qualified the organization for technical assistance and economic incentives for redevelopment. Then came the hard work of figuring out what to do and how to pay for it. We see the fruits of this labor in the streetscape plan (read it here: LARGE file) just approved by the City Council. The phased costs will be shared by stakeholders that include the City and the 6th Avenue Corridor organization, along with various grants. The goal is to use streetscape improvements as a tool for revitalizing the businesses and buildings that form the backbone of the surrounding neighborhood. In addition, the EPA will provide design assistance to help the incorporate "green" strategies into the proposed streetscape plan. Early next year, a team of designers and landscape architects is scheduled to participate in a three-day design workshop. Above is a rendering from the plan showing more pedestrian-friendly intersection at 6th and University... what you see is wider sidewalks, an expanded bus stop, street plantings, public art, and better lighting. What you don't see is a fundamental remaking of the critical node into a place that people want to be rather than want to pass through. In their defense, they are working with established businesses at this intersection and a set of parameters that limit this particular exploration to "streetscape" improvements. On the other hand, the Grand Vision will never come about if it isn't visioned. 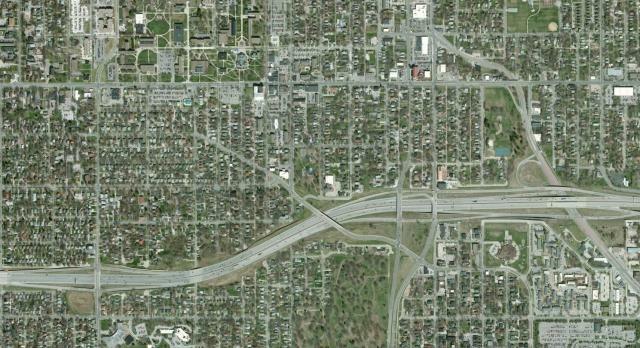 As built, the McDonald's and Quik Trip are, at their cores, anti-pedestrian. If the desire is to bring about a neighborhood-oriented, pedestrian friendly mixed-use district with residential, retail, and office uses that will serve the surrounding area as well as draw people from a wider radius, this intersection deserves to be planned as such. A fast-food use is not incompatible with this vision, but should be designed in such a way as to enhance the pedestrian experience rather than separate from it. A gas station use at this intersection is probably not compatible with the underlying 6th Avenue Corridor vision. 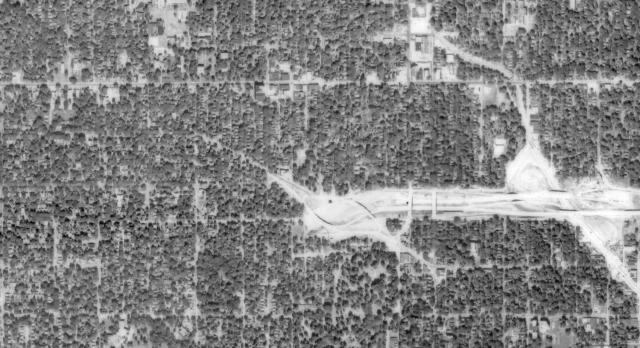 Particularly if the intention is to build a better connection through to the hospital on the south side of University. I was fortunate to spend this past Thanksgiving in Florida - enjoying the sun, hotdogs at Doc's All American (best hot dog in America? ), and of course a bit of urban analysis. Today's nugget comes from the seaside city of Delray Beach, located between Ft. Lauderdale and West Palm. 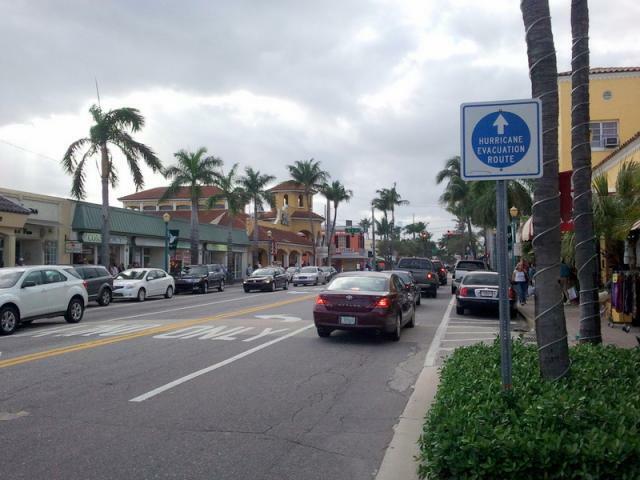 Delray has expanded well beyond its pedestrian urban roots - it is difficult to build UP in Florida due to hurricaines. The downtown business district, however, is clearly thriving with what appear to be three primary business types: restaurants (drawing both regulars and tourists), arts (galleries), and tourist traps (t-shirts/tchatchkes). Between those are scattered various other service and retail businesses like real estate agencies, opthamologists, and civic. On the Saturday after Thanksgiving, several blocks of side streets off the main drag were closed off to traffic for a massive art fair. A regular farmers market set up shop in the park outside our hotel as well. 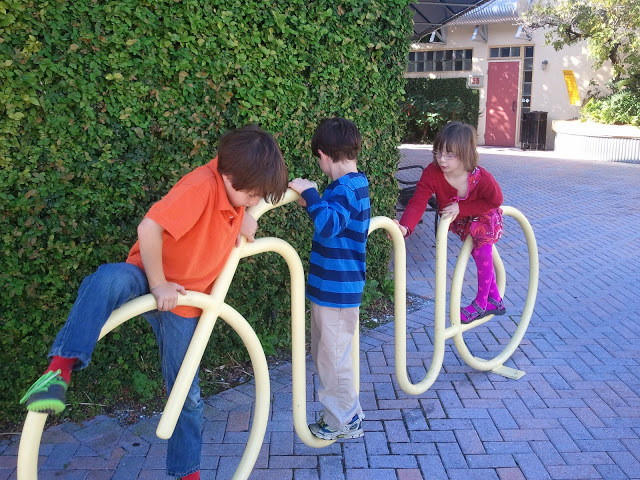 Whimsical Bike Rack: Whimsical bike rack serves double duty as a play structure when not being used for its "intended" purpose.